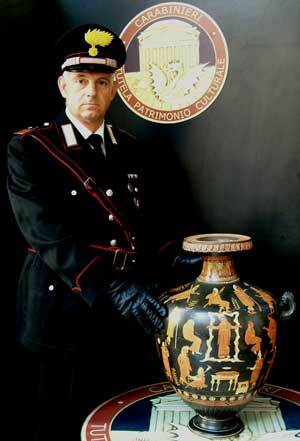 Earlier today the Carabinieri held a press conference at the Colosseum in Rome. They displayed 337 antiquities, worth some 15 million euros, that were returned from Geneva at the end of June 2010. They had been seized during a joint Italian-Swiss raid (Operation Andromeda) on the Geneva Freeport earlier this year. The objects appear to have been derived from archaeological sources in Lazio, Puglia, South Italy and Sicily, and Sardinia. They included a loutrophoros, a marble statue of Venus, Athenian and Apulian volute kraters, Canosan masked kraters, a Chalcidian cup, various bronze objects, Pompeian frescoes, and two Sardinian figures. The premises were linked to a Japanese art-dealer and a Swiss businessman. Neither is named. I note that the Miho Museum built its collection in part through a Swiss-based dealer. See now story on Bloomberg.